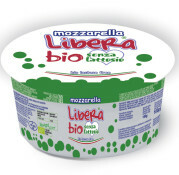 Ten years ago we created our brand Libera, with the first lactose free mozzarella on italian market, adding every year more products, such as burrata, scamorza, buffalo mozzarella, goat cheese. Our dedicated attention towards consumer’s needs led us to bet once more on quality, creating the first organic lactose free line in Italy. Cow’s milk mozzarella, burrata and stracciatella, made exclusively with the best certified milk from our breeding farms in Apulia, in the south of Italy. Our cattle are fed with cereals and fodder, without any O.G.M. or artificial food, with free access to pasture and a balanced space between number of animals and available area. The milk produced is analysed daily in certified external laboratories. In case of veterinary intervention the animals are treated exclusively with homeopathic or herbal medicine. Environmental sustainability, accurate supervision of raw materials and animal wellness are the key points of our « Bio » philosophy. 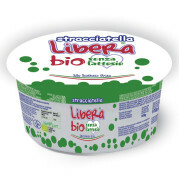 If you are lactose intolerant or if you are looking for a high quality cheese, healthy and organic, you will enjoy our « Libera Bio » line. 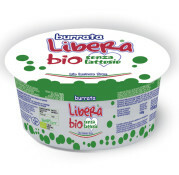 Nowadays BURRATA is probably the most typical fresh cheese in the market.